Huge 256GB Capacity. - Free SD Card Adapter. - High Speed (Speed Class 10), UHS-I. Sub-category: Micro SD. Water proof, temperature proof, x-ray proof, shock proof‡. New micro SD card! Comes with adapter and USB reader. USB stick may be different size/color than in photo. HUGE SALE PRICE!!! FAST SHIPPING!!! AMAZING SERVICE!!! FREE SD Adapter is included. Class 10 speed (based on SD 2.00 specification). Holds countless amounts of data, music, video, images etc. BUY THREE GET ONE FREE. EXTRA LOTS WILL BE AUTOMATICALLY SENT. Sub-category: Micro SD. Water proof, temperature proof, x-ray proof, shock proof‡. Weight (Kg): 0.01. The high-performance choice for digital image capture and storage. Speed class : CLASS10 U3 V30 A1. Storage temperature : -20°C-85°C. Working temperature : 0-70°C. Answer - capacity is real. The actual capacity will be smaller than the nominal capacity. Answer - The reading speed will vary depending on the speed of each country's network speed. Memory cards are a useful and portable way to expand the storage of any compatible device. There have been several developments in storage capacity, which has resulted in different models of microSD cards. 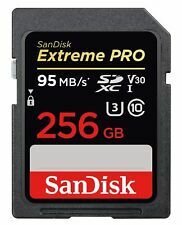 Brands like Samsung, SanDisk, PNY, and Verbatim are the primary manufacturers of high-performance GB class SD cards, with cards such as the EVO or EVO Plus by Samsung, the PNY Elite-X, and the SanDisk Ultra. Most Android-based smartphones fully support memory card expansion. MicroSD cards are also a highly reliable form of memory storage as they are essentially temperature-proof and shockproof. What Do MicroSDHC and MicroSDXC Represent? MicroSD cards may have HC or XC printed on them. These letters refer to the card type and its capacity, with HC standing for high capacity, and XC for extended capacity. 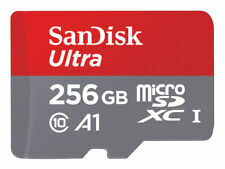 MicroSD HC: The microSDHC format has an upper memory limit of 32 GB and a read/write speed of approximately 25 MB/s. The SDHC is one of the most common formats currently and is compatible with most devices without the need for an adapter. 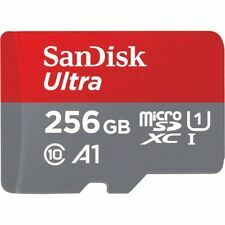 MicroSD XC: A relatively new design, the SDXC has a maximum memory limit of 2 TB, although cards with 64 GB, 128 GB, 256 GB, and 1TB of memory are more common. They have a maximum read/write speed of up to 312 MB/s, with a minimum of 30 MB/s. Some devices may require an SD adapter, card reader, or firmware upgrade to be able to use a SDXC format card. What Do Class 10, U3, and UHS-I Represent? MicroSD card read and write speeds were measured using a Speed Class of 1 to 10, which approximately equaled the card's minimum speed in MB/s. The new microSDXC cards are all higher than Class 10 by design as most have a minimum speed of 30MB/s or more. Because of this, there is also now the Ultra High Speed Class, or UHS. This is written on the microSD card as a "U" with a number inside or as "UHS-" followed by a number. The number is approximately equal to the card's minimum speed in multiples of 10 MB/s. UHS-I, UHS-II, and UHS-3 card therefore have speeds of about 10, 20, and 30 MB/s respectively. How Much Can a 256 GB microSDXC Card Store? While the exact number of files can vary. 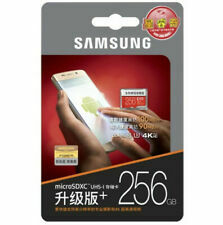 A 256 GB card is suitable for storing large amounts of high-resolution files or apps. Video: A 256 GB card can fit approximately 300 DVD quality movies or 70 Blu-ray quality movies. This is equal to hundreds of hours of high-resolution video. Images: A 256 GB card can hold approximately 32,000 high-quality images. Music: A 256 GB card can hold approximately 500 hours of music.